These Alignment in Love Ruby and Kyanite Spheres are so enchanting and amazing. To see both stones meld together so wonderfully in this offering is a testament of the unique medicine they bring individually and collectively. When you combine the psychic and communicative power of blue kyanite with the heart-opening and love-inducing medicine of ruby, you get a talisman that will beautifully help you to communicate the desires of your heart – and more! 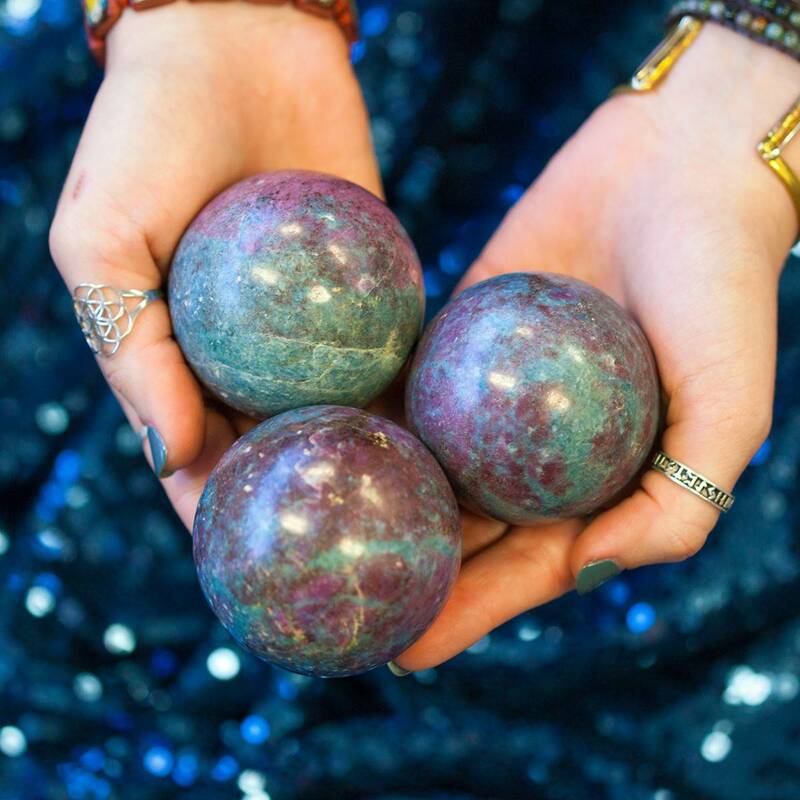 These ruby and kyanite spheres are absolutely magical – and their magic lies in the power of the stones they are made of. A high vibration stone, blue kyanite creates very rapid transfers of energy, which opens the psychic channels wide, and activates mind centers to enable faster downloads of information from higher sources. This is the only stone proven to instantly and evenly align all 7 chakra points, bringing you into fully centered presence. When the chakras are open and flowing, we are more susceptible and open to receive (and give) abundance. Passionate, yet grounded and fierce, the ruby opens the Heart Chakra wide. It heals the heart physically and emotionally, while igniting passion and boosting self-esteem. When we care for ourselves with love and gentleness, we heal, and in turn we can then attract the love that we are seeking. Ruby has many benefits but perhaps it is most known for its work and medicine on the Heart Chakra. This stone assists you in finding your Twin Flame, anam cara, or soulmate. It also strengthens the physical body and immune system, emanating the pure Red Ray with unsurpassed vibrancy. Work with these beautiful ruby and kyanite spheres to communicate with your spiritual team, to help you be open to the messages of spirit and to open your heart to the love awaiting to wash in, through and for you. Meditate with your sphere, knowing that when you are in alignment with the highest call of your life, any and everything will become possible for you! Be sure to get a sphere stand to go with your sphere! This listing is for one (1) Alignment in Love Ruby and Kyanite Sphere. I have two sizes to offer you: Small (about 2-2.5”), and Medium (about 2.5-3″). Please choose the size that calls to you from the drop-down menu. Yours will arrive lovingly parceled along with a single leaf of white sage and a card describing the properties of the stone. Madly in love with my ruby + blue kyanite sphere! I ordered the small and it was on the larger side – so luscious and weighty, it feels amazing to hold and is an anchor on my altar. And the color is just brilliant. Sage Goddess never disappoints! Thank you! !